Quilting, quilts and quilted items. Posted on October 9, 2013 by Julie / This entry was posted in Quilting. Bookmark the permalink. I love quilts. I love scrap quilts, especially. I had always wanted to make a quilt from my saved scraps, which I finally did two years ago. 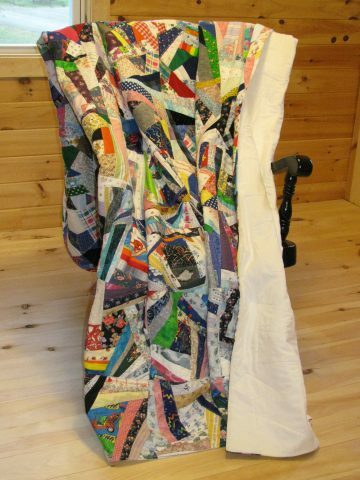 When I started working on my quilt, which I was making in a crazy quilt fashion without all the decorative stitches, I had a memory come back to me from my childhood. When I was a little girl, there was a scrap quilt on my bed. I can’t remember much about it except that it had a lot of pieces, it must of had a cloth foundation under the blocks, and it was colorful. I am guessing it had a foundation because I know it had a hole in it and when I put my finger in the hole, there was cloth underneath. I don’t know what happened to that quilt. I don’t know who made it. I would like to think it was made by my grandmother on her treadle machine. I am not even sure if my grandmother owned a treadle machine, but since we had one, I am guessing it came from an ancestor. I know we had a lot of my grandmother’s household belongings in boxes in the barn after she passed. It is natural to think that the treadle was hers also, and the thought that follows would be that she made that quilt on my bed. It is interesting that the memory only popped up once I started piecing my own quilt from scraps. The blocks reminded me of that quilt from my childhood. Somewhere, there might be a picture of that quilt as I know that there are pictures of our kitty lying on my bed. Someday, maybe I will see that quilt again, if only in a photo. Contents Copyright Maine Quilt Company. All Rights Reserved.